Japan loves stationery, some shops were literally wall to wall with pens alone. It was incredible, I could have gone crazy but I didn't. I loved looking at all the kawaii products but they're not really my thing, what I'm really into are the modern and functional office supplies - and what better excuse for buying stationery is there than wanting to give the studio supplies a little refresh? Stationery Organiser | because what more could a girl want than something to organise her stationery? Okina Project Paper Sticker Memo | who doesn't like grid paper, am I right? 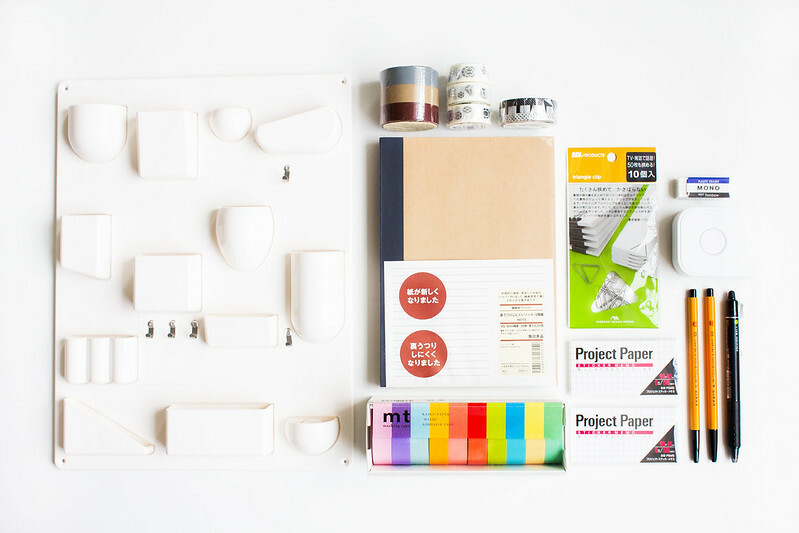 Oh myyyyyy, my stationery addict self is very happy reading this post! These all look so nice ! I'm a stationery addict! This just makes me want to go shopping. Just bought a big pack of those Mono erasers! It's funny how a little eraser can motivate me to do my homework, but it's so cute! Works well too. :) Awesome haul. I'm addicted to stationery and always have been but I never new you could pick up Japanese stationery in the UK, well except at Muji that is! I'll definitely be doing a little bit of online browsing this afternoon which will no doubt result in a cheeky order! What is it about washi tape that is just so appealing? I have absolutely no need for it and yet I want all of it! This stationery looks incredible! You're so so lucky! MUJI is awesome, their notebooks are my favourite - I don't really use anything else. Ha, I feel the same. I'm surprised I didn't buy more but there was so much choice it was overwhelming. I want more - I can never have enough. There's always room for a bit more stationery.. They're actually a little bit rubbish.. they don't really hold stuff unless you're clipping together a lot of sheets. The organiser is super useful for using in the studio though. I love washi tape.. although I need to start using it more on gifts to people. I use only black for packaging orders, which looks great but is a little boring! I'm not sure luck has played much of a part in it! I would have bought 10 pack of those colored spine notebooks, if we're being honest here. I love Japanese design and stationery - minimal yet functional, exactly how it should be when it comes to office supplies! MUJI is one of my favourite shops of all time, it's so clean and simple and elegant, but unfortunately the one near me closed down (*sighs sadly*) so I have to get my stationery fix elsewhere these days or order online. I'm so envious of your organised little haul, if there's any more reason I need to visit Japan it's to stock up on desk treats and the like! That organizer is everything!! I would have bought a dozen of those notebooks, too! Here in South Africa it's very difficult to find nice stationary like this and almost impossible to order it online! I'd be exactly the same, I'd keep saving it for something 'special'! Right?! I even started writing notes in pencil even though I usually write in pen just so I can use the eraser! LOL! i'm going to Japan next year and I know I will die around stationery there. It's going to be a good death. I'll be happy.